We currently have 2 broodmares. Our aim is to have broodmares of top quality, between 14,2h and 16,2h of excellent conformation, temperament and bloodlines. 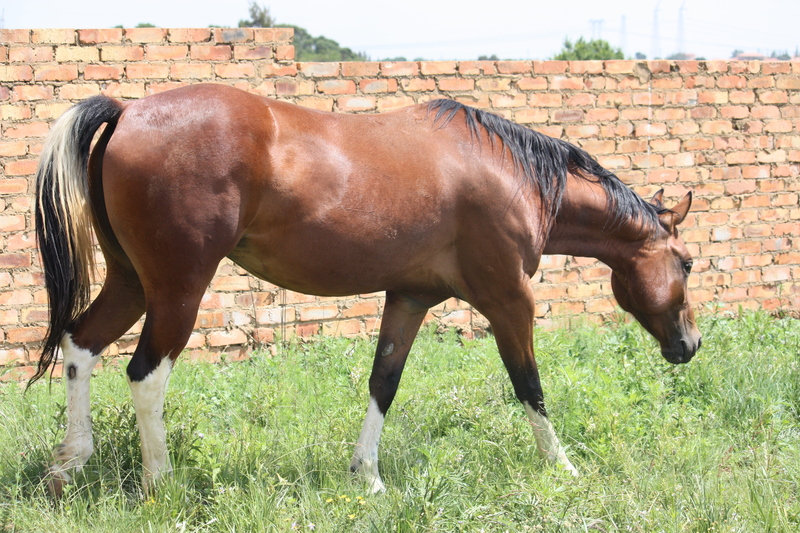 The mares kept open as riding horses will be shown in western (APHA/AQHA) classes, Paint Horse Southern Africa (APHSA), Reining and Western dressage classes as it is our belief that all our horses should be under saddle and of show quality. 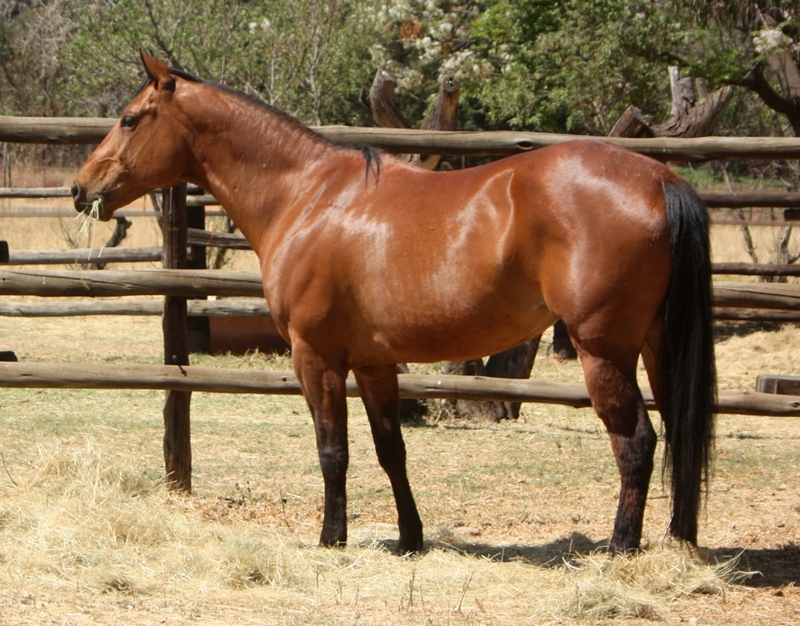 All mares are registered with APHA (USA) and AQHA (USA). Quarter horse mares are registered with APHA as solid breeding stock to enable us to breed purebred American Paint Horses with our homozygous tobiano Stud Stallion Amarillo Poco EazyMcQ. All mares are current on inoculations, farrier work, dentistry and deworming. They all have current passports. We strive to breed both American Paint Horses and American Quarter Horses of outstanding Quality, conformation and temperament. CalVal Pardon My Dust, by Bronco King Baracuda x Caledonvalley Applebum, d.o.b. 22/09/2011. She is 6 panel NN and colour tested as heterozygous black with nd1/nd2 gene displaying dun factors but not a dun. She produced a smokey black QH colt in September 2015 and a black tobiano colt on 26/11/2016 by McQ. 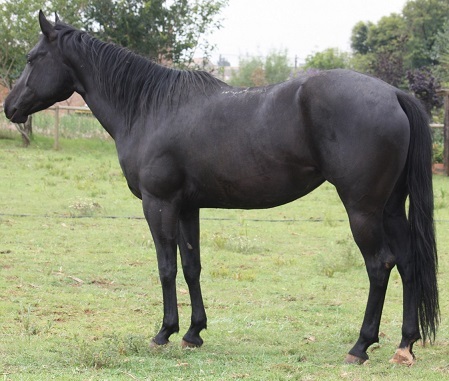 Her 2016 colt, Uniquine McNiteFrost that will be retained. She will be kept open as my personal riding horse for a couple of years. Mounteys Alotto Lena, d.o.b. 31/01/2012, liver chestnut tobiano mare by A Painted Smart Olena (APHA IMP Germany) x Bar Babyface Jess (Dillions JB Lynx (AQHA IMP USA) x Precious Jessie (AQHA IMP USA). She is 6 panel NN and colour tested heterozygous tobiano. Lotto produced a beautifull liver chestnut tobiano filly by McQ on 01/11/2016, Uniquine McWinALot. This talented mare will now start her show career. 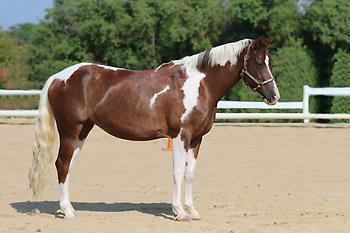 Amarillo Doc Jubyleo by Dillions JB Lynx (AQHA IMP USA) (Kansas Dillion x Doc Foxie Doc) x Redclifton Tam Jo Leo. Dillions is a nephew of Mr Gunsmoke - world champion all-round cow horse (NRHA Hall of Fame) and sire of top cutting,reining and working cow horses. He is also a Grandson of Doc Lynx. Deceased 21/07/2014.